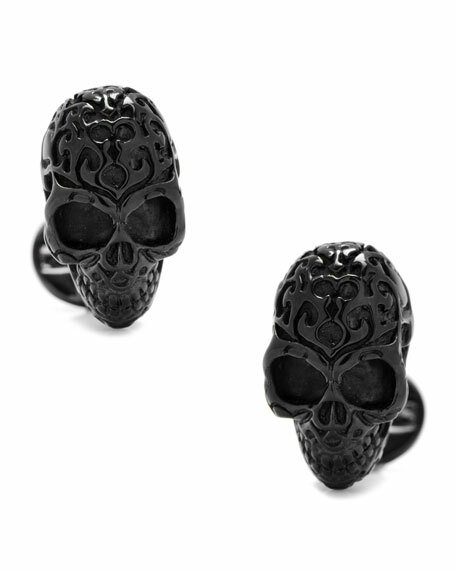 Cufflinks Inc. three-dimensional "Fatale Skull" cuff links. Cufflinks Inc. diamond-pattern cufflinks. Polished silvertone hardware and backs. Diamond-argyle pattern at square face. Mother-of-pearl, onyx and blue stone. Bullet back closure. Approx. 5/8" x 5/8". Imported. Cufflinks Inc. rectangular cat eye cufflinks. Polished silvertone hardware and settings. Wrapped navy blue cat eye inlay. Bullet back closure. Cufflinks Inc. rectangular cat eye cufflinks. Polished silvertone hardware and settings. Wrapped navy blue cat eye inlay. Bullet back closure. Approx. 3/4" x 1/2". Imported. Ermenegildo Zegna twisted Leath knot cuff links. Blue leather inlay. Rhodium-plated base metal. 0.6"H x 0.6"W x 0.9"L. Imported.